Generation Y, born after 1980, are the new generation of young people making their mark. What do they think about the world? What does their spirituality look like? What are the implications of this for the Church? Based on original research, this title explores how young people draw on popular culture to shape their world view and spirituality, with results that suggest that many of the Churchs assumptions about this generation have been wrong. How can the Church begin to reconnect with this generation? Making Sense of Generation Y grapples with this challenging question and suggests ways forward. Essential reading for clergy, youth workers and all those wishing to engage with young people. - Publisher For Generation Y, born after 1982, Margaret Thatcher is a piece of social history, relationships happen over the internet and music marks their territory. How does this generation think about the world? What does their spirituality look like? And what implications does this have for the Church? Based on original research, Making Sense of Generation Y explores how young people aged 15-25 draw on popular culture to shape their worldview and spirituality. The results of this research suggest that many of the Church's previous assumptions about this generation have been wrong. How can the Church begin to reconnect with this generation? Making Sense of Generation Y grapples with this challenging question and suggests ways forward. This title is essential reading for clergy, youth workers and all those wishing to engage with young people. 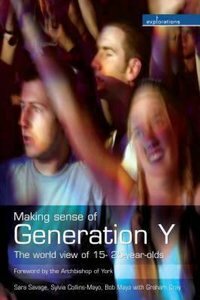 - Publisher Based on ground breaking research, this work outlines how 'Generation Y' (those born after 1980) shape their worldview and spirituality through the popular arts - music, clubbing, TV soaps - and looks at the implications for the church. About "Making Sense of Generation Y"
For Generation Y, born after 1982, Margaret Thatcher is a piece of social history, relationships happen over the internet and music marks their territory. How does this generation think about the world? What does their spirituality look like? And what implications does this have for the Church? Based on original research, Making Sense of Generation Y explores how young people aged 15-25 draw on popular culture to shape their worldview and spirituality. The results of this research suggest that many of the Church's previous assumptions about this generation have been wrong. How can the Church begin to reconnect with this generation? Making Sense of Generation Y grapples with this challenging question and suggests ways forward. This title is essential reading for clergy, youth workers and all those wishing to engage with young people. Based on ground breaking research, this work outlines how 'Generation Y' (those born after 1980) shape their worldview and spirituality through the popular arts - music, clubbing, TV soaps - and looks at the implications for the church. Sara Savage is a lecturer in the Cambridge Theological Federation. The Revd Dr Bob Mayo is the vicar of St Stephen's Church, Shepherds Bush, and the chaplain of Queens Park Rangers. His previous publications include Gospel Exploded (SPCK, 1996), Ambiguous Evangelism (SPCK, 2004) and Making Sense of Generation Y (Church House, 2006). He was previously the Cambridge course director for the Centre for Youth Ministry Degree in Applied Theology and Youth and Community Work, based at Ridley Hall. Graham Cray is the Bishop of Maidstone and the Bishop for Mission in the Diocese of Canterbury, and is currently chairman of the Soul Survivor Trust and a member of the Council of the Evangelical Alliance. He chaired the working party which wrote the Mission Shaped Church report on church planting and fresh expressions of church. Graham is married to Jackie and they have two daughters. He written a number of books that interpret culture and how to best relate the gospel to the changes taking place, these include: Making Sense of Generation Y: The World View of 15- to 25-year-olds (Explorations), Disciples and Citizens: A Vision for Distinctive Living, Leadership in Mission Shaped Churches: emerging theological and practical models, Mission-shaped Youth: Rethinking Young People and Church and Postmodern Culture and Youth Discipleship: Commitment or Looking Cool?